The new extension to Cullompton Cemetery has had new gates installed and a public ceremony to dedicate the gates took place on 10 September 2015. The ceremony was led by Reverends Edward Hobbs of St Andrew’s Church and Glen Graham of the Baptist Church. 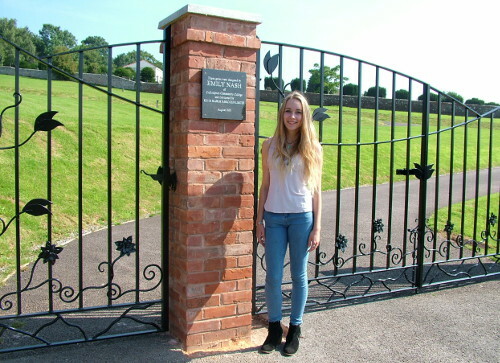 The gates were constructed using drawings made by Emily Nash, formerly of Cullompton Community College, as part of her GCSE Art project and capture the rolling hills surrounding Cullompton. A plaque has been engraved and installed on the central gate pillar giving Emily the credit she richly deserves. The extension to Cullompton Cemetery is a £300,000 project and will extend the life of the cemetery well into the next century and local people are already being buried in the area, named Camellia. There is a separate area for cremated remains named Magnolia, an area specifically for children named Primrose and space in which natural burials can take place. In addition, a new accessible path has been installed providing access from the car park and the access from the existing part of the cemetery to the new, making accessibility less difficult for those with limited mobility. Emily Nash with the gates she designed as part of her GCSE Art project. Fees are reviewed annually and new fees are effective from April of each year.